WESTON — Local first responders and professionals from the oil and gas industry attended a mock gas-line strike demonstration at the West Virginia State Fire Academy near Weston on Tuesday. The mock strike, performed by volunteers, gave attendees a visual example of the dangers that can arise on a job site if workers fail to follow proper safety procedures when digging near a buried gas pipeline. The demonstration was broken into two parts: The right way and the wrong way. During the first run of the mock strike, workers followed all the rules and took all necessary precautions before digging, including properly marking the line’s location, placing a call to West Virginia 811 and waiting for a site inspector to verify the location. Things didn’t go so smoothly the second time around. The workers didn’t check to see if a line was present. And one of the workers even stepped away to take a phone call. 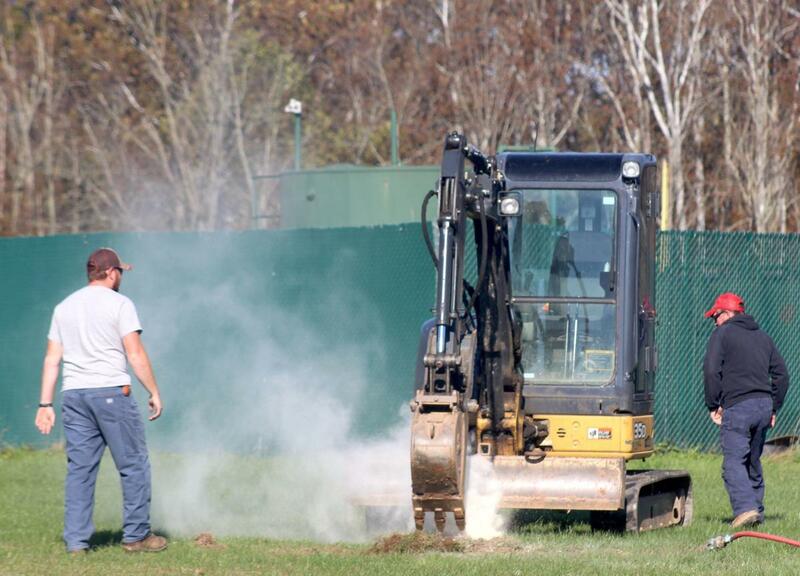 While his back was turned, a worker operating an excavator proceeded to dig and shortly struck an active gas line causing a simulated cloud of thick white smoke to rise up and cover the area. After a call to 911, firefighters arrived on the scene and used a fire house to suppress the smoke. Paramedics arrived shortly after and treated the workers affected by the line break. Madison Mason, director of sales for Enertech, the company that put on the mock strike, said the demonstrations are intended to help workers and first responders realize the importance of following proper procedures. Enertech puts on similar demonstrations across the country for groups of professionals, Mason said. Rich Swiger, a technical specialist with Dominion Energy, said having a live demonstration is much more impactful than just handing out a pamphlet or sitting through a lecture on safety.